There are 36 PEZ in the "D" truck series - 4 different style cabs - 4 different color cabs - 2 different color stems (3 for the yellow cab). The chart above has a check mark by the units which have been in the Cornwall collection for some time. The reasoning was that to have 1 each of the 4 different style cabs in each of the 4 colors (=16 + 2 more which we happened to have) would be representative of the series, thinking that stem color variations were not that significant. (And this saved a lot of display space.) That reasoning has been trucked down the road. Today a source was found for the last 3 (the R1 yellow cab/blue stem was a tuffie) to complete the entire 36 series. They came from 4 different e-bay sources for a few cents to a few bucks. We were lucky that most were being sold in groups over the past few months with others we needed. We did end up with 4 repeats. p.s. I did NOT make the truck chart, but is sure was handy to keep track of the Comings and Goings - oh yeah, that's the other blog. REMY - The rat star of the movie. EMILE - Remey's brother (who likes to eat). LINGUINI - The young cook that joins with Remy to do great culinary things. SKINNER - The angry Chef. "Ratatouille," (rat-a-too-ee) a new animated-adventure by Pixar out 29 Jun. centering on an ambitious French Rat named Remy who dreams of becoming a great chef. Remy accidentally uproots his family from the French countryside and finds himself ideally situated beneath a famous Paris restaurant . These just hit ebay so they should be in retail stores soon. Good luck in your rat hunting. Spiderman NF also quickly came on board. He is a smaller "small head" Spidey. And now gives the collection a nice little Spiderman clan. and a complete NF superhero vintage set. 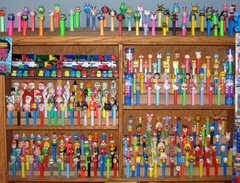 If you want to see a major PEZ display case check out this link. Scroll way down past all the cabinetry making pics to this guy's collection. And then - don't call me crazy. Wait til I DO have a collection and cabinet like this guy. A Fat Eared Bunny (FEB), a Rooster, and a Lamb came and joined our Easter PEZ family just today. That fun Easter Bunny delivered 2) Furry Bunny Key Chains and 4) Plastic Egg Packaged current Easter character series. The INCREDIBLE HULK "A" joined the collection recently. Before close examination one could easily think that the dark green Hulk A was from the same mold as lime green Hulk B, just with no-feet (NF). Not so! The museum now houses the whole family of Hulks A - C.
The Cornwall Collection already has a Batman (NF) to be a friend to Hulk (NF). Soon we will have to have some other NF Superheros join the series - I am thinking of Wonder Woman and Spiderman. 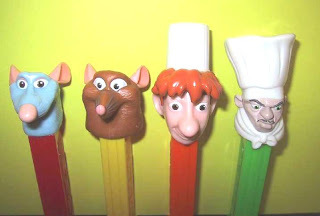 Robb mentioned a ZORRO Pez being added to the collection in honor of his birthday. No one has seen it until now. This was obtained on a lucky ebay bid. No one happened to be going for it so it sold for about half price for what they usually go for. Ol' Jeffrey comes through for Robb's Birthday with the 3rd (of 8) of the football series. This adds to the Florida State Gators Jeff sent for Christmas and the U. of F. Seminoles Dad got for his birthday. Jeff seems to be our only source for these. I don't think we have 5 more birthdays before Jeff gets home tho'. Word is that Pez is also coming out with 2 more - Ohio and Notre Dame later this year. I just wanted to make my first official post on this blog, I don't know how much I will be able to post but I will try my very best. But it sure is fun to be part of 2 very fun blogs, I hope we can continue to grow.